“An Indenture of Conveyance dated 11th April, 1940 between Mr. W.G. Jones of the one part and the National Council of the other part regarding a piece of land at Manchester Place Hirwaun. Whereas The National Council have erected buildings on the said piece of land for the purposes of their work as hereinafter stated. (Info taken from a Declaration of Trust document dated 18th day of January 1945). That is how our YMCA as we know it came into being. During the late 1940s and into the 1950s Mr. Alwyn G. Thomas was in charge and it became a major and very popular venue for young boys of the village. A choir was formed ‘The Silver Songsters’ conducted by Mr. Thomas and accompanied by Mr. Gwyn Edwards, who gave regular concerts, especially on Sunday evenings when people went to the concerts after attending their own places of worship. Many activities were introduced and the ‘YM’ became a thriving place. When Mr. Alwyn Thomas retired Mr. Yorath Thomas took over and with Marie his wife a wonderful era of sports and entertainment for young people began. In the 1950s the Y.M.C.A. was used to school Hungarian Refugees in English by the N.C.B. Tutors. They were welcomed by Yorie and to show appreciation painted and did simple repairs. There was a visit of 17 Danish students for a week. 10 boys slept in the Y.M.C.A. while the girls stayed in various lodgings in the village. Valmai Edwards escorted the visitors to see our industries and schools. The Y.M.C.A. was also used for wedding receptions with Mrs. F. Rowe in charge of the catering. Annual dinners were held with as many as a hundred guests. There was also an annual Christmas party. A drama festival was arranged with many villages participating. The Y.M. also took part in the carnivals of the village. There were many variety concerts. The social highlight of the week were the Saturday night dances, which progressed to a Wednesday night as well. In the 1960s and the 1970s the Y.M.C.A. was yet again a hive of activity with concerts pantomimes, drama, dances, sports and away days. 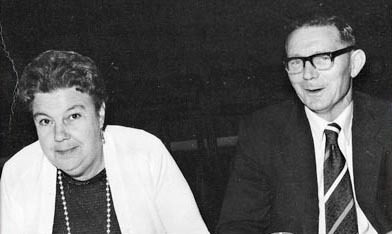 For several years Yorie and Marie would take a number of members to Saundersfoot for three weeks of camping, this was enjoyed by all who went. In 1963 The Y.M.C.A. silver band came into being led by the baton of George Morris. The sports teams were winning all sorts of trophies. You could also enter the Duke of Edinburgh award scheme through the Y.M.C.A. In 1978 Hirwaun Y.M.C.A was presented with a rose bowl for being the most active club in Wales. What a triumph! The success of the Y.M.C.A. was down to Yorie and Marie who lived on the premises and were dedicated to the youth of the day. All the members of the Y.M.C.A who remember this era have only wonderful memories of the times when everyone worked together as a team and were proud when their production came to fruition. 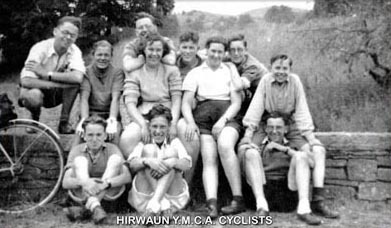 In 1945 a group of young lads who were members of Hirwaun Y.M.C.A came up with the idea of forming a cycling club. The lads eagerly set things up and the Hirwaun (Y.M.C.A) Wheelers was formed, later dropping the Y.M.C.A from its title. Cycling in Hirwaun owes so much to the founding fathers. Yorath Thomas, Trevor Poe, Will Hill, Ken Holt, Trevor Drew, Gwyn Jones, Hugh Jones, Dai Cahill, Eddie Aldred and Morgan (Mock) Edwards. Football Teams – One of which in the 1960s won everything possible in the league year. In the 1960s and 1970’s The Y.M.C.A. produced 16 pantomimes performed in the Coliseum Aberdare and the Y.M.C.A. itself. Jack and the Beanstalk, Mother Goose, Puss in Boots ,Aladdin, Robinson Crusoe, Babes in the Wood, Hansel and Gretel, Sleeping Beauty, Snow White. This was a mammoth task but it was greatly appreciated by all in the valley who spent many a happy hour being entertained. Mr. David Jones Teacher painted the sets with the help of members. Mr. Allen Woodward directed and also took the part of the Pantomime Dame. Mrs. Violet Lloyd of the Crystals choreographed. Women’s Auxiliary committee held sewing sessions to make the costumes. The cast of Aladdin also performed in St Mairs Day Centre. A production of the Long and the Short and the Tall was put on in the Y.M.C.A with Yorie Thomas as the Japanese prisoner. YOU CAN VIEW SOME PHOTOGRAPHS FROM THIS PRODUCTION AND A FEW OTHERS BY CLICKING HERE. Monies received from this production was donated to the Aberfan Disaster Fund.